Polarization between political religionists and militant secularists on both sides of the Atlantic is on the rise. Critically engaging with traditional secularism and religious accommodationism, this collection introduces a constitutional secularism that robustly meets contemporary challenges. 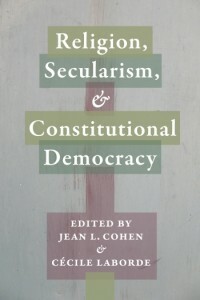 It identifies which connections between religion and the state are compatible with the liberal, republican, and democratic principles of constitutional democracy and assesses the success of their implementation in the birthplace of political secularism: the United States and Western Europe. Approaching this issue from philosophical, legal, historical, political, and sociological perspectives, the contributors wage a thorough defense of their project’s theoretical and institutional legitimacy. Their work brings fresh insight to debates over the balance of human rights and religious freedom, the proper definition of a nonestablishment norm, and the relationship between sovereignty and legal pluralism. They discuss the genealogy of and tensions involving international legal rights to religious freedom, religious symbols in public spaces, religious arguments in public debates, the jurisdiction of religious authorities in personal law, and the dilemmas of religious accommodation in national constitutions and public policy when it violates international human rights agreements or liberal-democratic principles. If we profoundly rethink the concepts of religion and secularism, these thinkers argue, a principled adjudication of competing claims becomes possible. Read more on the book here.